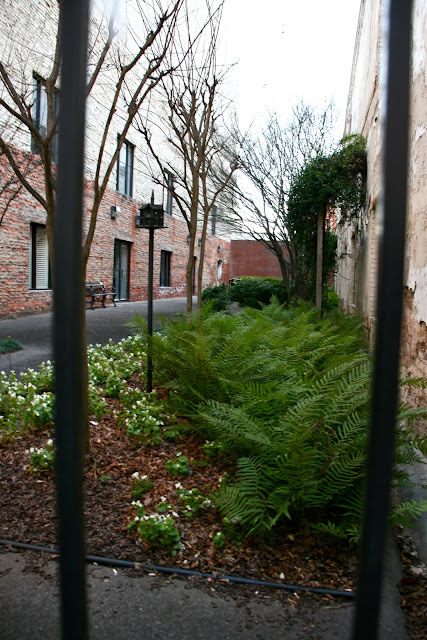 This quiet little courtyard on Second Avenue North in downtown Birmingham was created in memory of Ronnie Noojin, a Birmingham attorney and past president of the Birmingham Bar Foundation. Ronnie was loved and admired by many. What a lovely tribute to him. Well this is just genius if you ask me. All the herbs, planted in these great old boxes, the whole schamolly DONE! All you have to do is drop down to the Pepper Place Market next Saturday and pick one up. Where's V?? Maybe this hint will help. Recently I dropped in Architectural Heritage to have a little look around. I spotted these old medicine bottles and got a chuckle when I spotted one named pour moi! I could Google polygala, but I decided my clever commenters would have more creative ideas. All I can say is, I hope whatever the remedy it provides includes poison ivy relief! This week, I'll be having a fine time with a very fun crowd of fellow bloggers and blog readers. I won't have a lot of time for blog visits, I hope you'll understand. Oh yes, there will be photos to follow. This pretty girl found a grand way to cool off by dipping her toes in the fountain at Linn Park, in downtown Birmingham during the Magic City Art Connection. For the next week I will be visiting with fellow bloggers so I regret I won't be able to visit your blogs as often. Stay tuned for many photos! I returned to the Magic City Art Connection again yesterday, and I'm very glad I did. What would you think the chances would be that I would walk by someone singing French songs in Linn Park in downtown Birmingham, Alabama? Well, I was very fortunate to find Michelet Innocent playing the guitar and singing a French chanson, and with a beautiful voice, I might add. I couldn't get my money out fast enough to purchase his CD L'Existence. A very nice "Paris Moment" right here at home. Friday I spent about three hours downtown at Linn Park. The Magic City Art Connection cranked up at 10 and I was right there. Sadly Saturday was a wash out. Today looks much better, so you Birmingham readers PLEASE go down and support the artists that have come from all over the country for this great event. Sunday hours.....10-6! 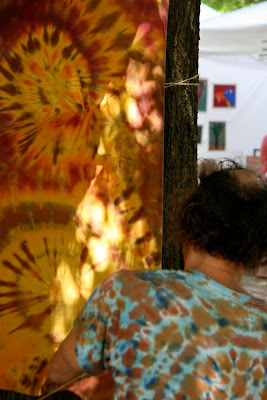 Today, I am featuring Jonah Tobin Shaffer, who had a wonderful display of tie dyed garments and fabric that was gloriously blowing in the wonderful spring breeze. Many more photos of this great event to follow this week. I took this shot yesterday at Linn Park. 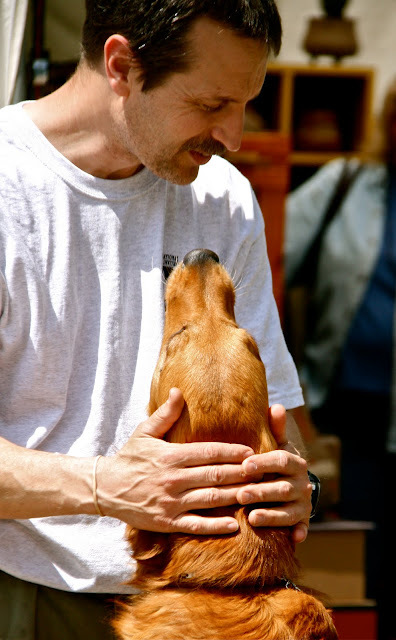 This man and his best friend touched my heart. My dear Baxter looked just like this one, and I can promise you I loved him as much as this man does his beautiful friend. Don't worry, I gave this pup a scratch behind the ears and told him what a good boy he was! As a photographer , it is a privilege to capture some special moments with my camera. This is one of those times for me. This cute little guy happens to be the grandson of my friend Joe O'Donnell. He was having some big fun dancing to the music at the Pepper Place last Saturday, but I loved this shot the most, as he grabbed his sweet Momma's hand. I thought I'd let the Beatles sing a little song for you today, I Want To Hold Your Hand of course! What else? Homemade jelly from the Pepper Place Market. Recently I've found another interesting blog to follow ( like I need more!). Costas' Naturedigital has some wonderful photographs from his very photogenic homeland of Greece. 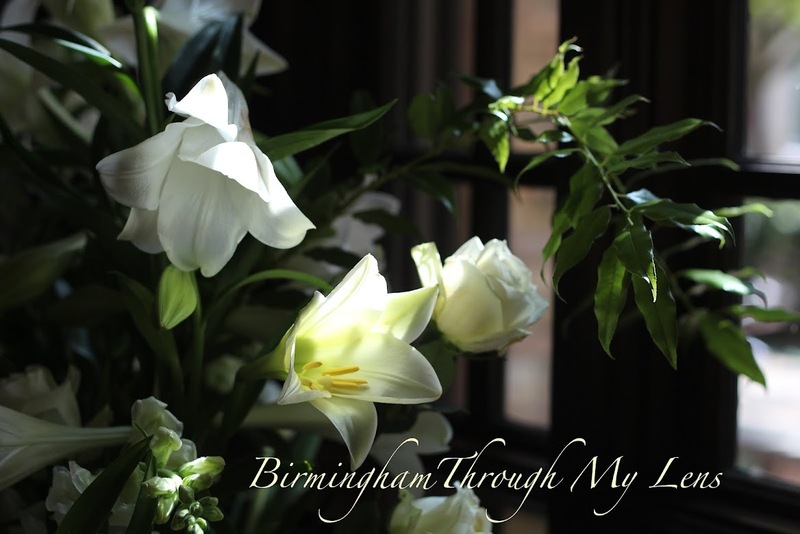 I have many dear Greek friends here in Birmingham, and so I have been particularly interested in his blog. It reminded me that I visited Tsitalia recently. 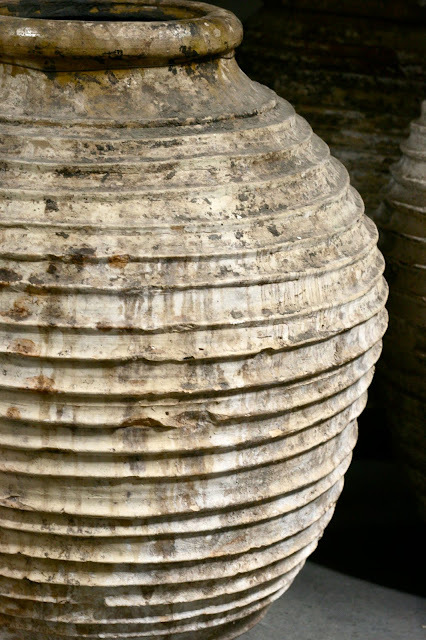 This is the place to go for fabulous pots, jars and urns of ALL sizes and shapes from Greece and Turkey . They also sell wonderful spices, olives and olive oil. I'll be shopping there more often as it's on the Southside, near my home. The top photo is a weathered jar that I thought just so sculptural and beautiful. Yes, I wanted to take it right home-except there is this SIZE problem. At the bottom are threshing boards. Wikipedia says "they are obsolete farm implements used to separate the cereals from their straw." I wanted one of those too. I do a lot of threshing and I need a new one! Sunday, I visited the Magic City Blues Society's Phelan Park Music Series for the first time. Well I've been missing out on some mighty fine music, I can tell you that much! Today I add Stranger 101 to the ongoing challenge. This is the drummer for Robin Rogers' Band. What a nice guy! More from the festival in days to come. Sometimes you don't have to look far for an image. Last week all I had to do was stroll out on my friend Susan's terrace with a glass of wine and voilà! There she was hanging on the wall, with tendrils of greenery framing her sweet face. She reminded me of some lovely sculpture found on many buildings in Paris that I've featured today on Paris Through My Lens. Oh I want these boots!!! Sometimes a little "theme" just parades right by you. 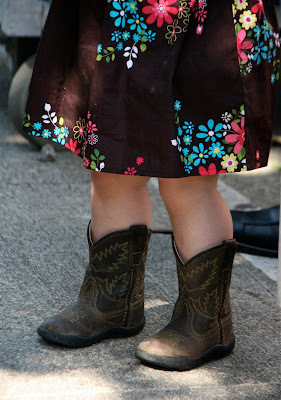 That's what happened Saturday at the Pepper Place Spring Market. I was sitting in the shade listening to music and look what I snapped without having to even get out of my chair! HOT DOG! It's Pepper Place Market Time! Keera sporting her PPM cap! Come Saturday, I'll be a very happy camper. That's the day the Pepper Place Market cranks back up for a new extended calendar. It's been a long winter and I'm ready to get a cup of coffee from O'Kafe's booth and park myself at a table, listen to some fine live music and snap away. Today, a little preview. I've been secretly stashing PPDs (Pepper Place Dogs) for the past two years, so I thought I'd let these cute pooches be the stars today. For you Alabama readers, the market is on 2nd Avenue South and open every Saturday from 7:00am - 12:00. Come and support our Alabama farmers and craftsmen, see cooking and gardening demonstrations, listen to some terrific Alabama musicans and eat some good food! Elvis brought his human along. What can I say, Teddy's all ears. and a few daffodils short. Forgive me for this late breaking photo. I played around with a bunch of daffodils a while back for my photography class, as an example of how to use light in different ways. I had great fun and learned a lot as well . Before spring scoots out the door, I'd like to share a few of my experiments with you. Spring makes us all daffy, n'est-ce pas?? A few weeks ago when I was in Wylam to photograph the Habitat for Humanity home, I passed this vegetable stand, in what was once an old service station. Earlier in the week when I went by, the buggy was full of turnip greens. This day there were only two bunches left. If you are thinking, "Greens, I thought you ate the turnips!!! ", well... you're not from around here. Birmingham Rouge - Watch It! As promised on Theme Day, another look at the Irondale Chamber of Commerce's "office". I had to drive all over Forest Park chasing this one! I recently returned to Birmingham's Oak Hill Cemetery with my granddaughter's Brownie Troop. One of the dads, Stuart Oates, is the curator and gave us a wonderful walking tour of the grounds. Deeded in 1873, it was the first city cemetery and the resting place for many of Birmingham's founding fathers and their families. Today a cherub that I thought quite beautiful. It was a glorious spring day and the wildflowers covered the lawn as seen in the photo below. Say the word Dreamland to anybody here or in Tuscaloosa ( or probably anywhere else in Alabama) and they'll say "RIBS!". Dreamland has been cooking ribs since they opened their first place outside of Tuscaloosa back in 1958. As the story goes, John "Big Daddy" Bishop was a hard working mason. One night he got on his knees a prayed for another way to make a living. That night he dreamed of opening a café! I love that story! I visited the original Dreamland years ago. The menu consisted of ribs, white sandwich bread, and sauce, period. No chips, no slaw, no beans, ......oh but they had beer! :) If you got hungry waiting on your ribs, you just ordered a cup of sauce and dipped your bread in it. (I am not making that up!) And the place was so small that they stored the bread out back in an old delapidated car! Today Birmingham has it's own Dreamland on the southside. A good deal larger, and I cased the joint and there was no sign of bread stored in a vehicle of any kind. The menu has also expanded but they still cook the ribs on an open pit in the back. And for the record, their banana pudding will make you want to slap your grandmomma! A few of my students joined me this past week for a little photo shoot. Today, the stools emblazoned with the likeness of Big Daddy Bishop and the license plates nailed all over the place. As their slogan says, "Ain't nothing like em - nowhere!" Darlin, the wisteria is finally in bloom! Yesterday some of the students in my photography class joined me at The Garage for a little photo shoot. Owner, architect Fritz Woehle gave us just the grandest tour of his marvelous space full of antiques, and well just about anything you can imagine. I pressed my camera against the glass for this shot. You can see the reflection of the outdoor eating/drinking area as well. Oh I have so many more photos to come! What goes up must come down. 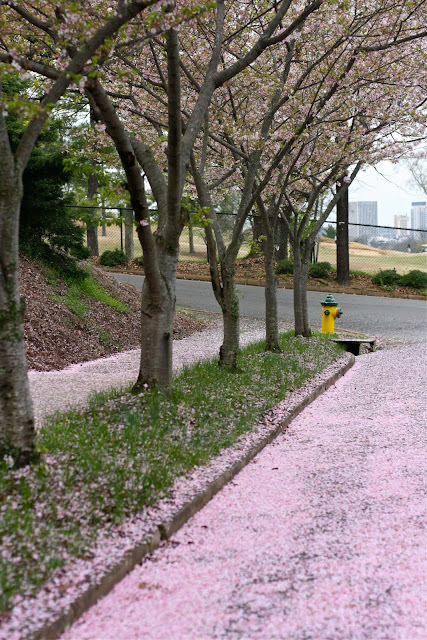 My neighborhood was blessed with a blanket of pink and white blossoms. Ahhh .......spring! When I spotted this pretty little potted orange tree at Oak Street Garden Shop recently, I immediately thought of mon chère amie Jilly, who has not one but two fabulous Daily Photo blogs. She blogs from Monte Carlo and Menton, France. Menton is widely known for it's Fête du Citron. Have a look here and here, but my favorite photograph is here. A little bit of Menton right here in Birmingham! A former bank, now the "fabulous" Alabama Gas Corporation, 20th Street South. For all of you that celebrate this day, Easter blessings! It's almost Easter, so I thought this gorgeous chapeau that I found at Christine's in Mountain Brook Village, would be just the thing. I think it looks like it could very well be in the window of Marie Mercié in Paris. Today, Christians around the world celebrate Good Friday. This lovely statue was photographed at The Garage. CDP Theme Day - RED! Today is the first of the month, so it's Theme Day for City Daily Photo Bloggers all over the world. Today we are all seeing red! Well this theme has my name written all over it! I had quite a few to choose from of course, but decided to share this one. This is the old caboose, right off the tracks where the Irondale Chamber of Commerce hangs out. It was great fun to photograph, in fact I have a few more to sprinkle around in days to come. My fellow bloggers have some terrific photos to share. Please give them a visit.